Thus, a new idea has emerged. I’m going to try to give you all at least one, hopefully two new recipes each week. What I will do is the day before I post a video, I will let you know what tomorrow’s soup will be and include a shopping list. This way if you are an impulsive souper, like myself, you can have all your ingredients on-hand and make the soup when the video is hot-off-the-press. Note: There are two ways that you can do this soup. The soup that I will be making tomorrow has a chicken broth base and consistency, but if you would rather have more of a tomato flavor to your soup, you can also add a 28 oz can of crushed tomatoes, which will create a thicker tomato-based broth. It will also make a lot more soup! I know that you have all been staying up at night pondering the age old question, “What do dogs prefer dog food or soup?” Well, my fellow soupers, you are about to get the answer and you can thank me after for all the sleep that you will be catching up on. Since I’ve fallen in love with souping, I have playful named days where I made more than one soup (which actually happens more than you would think) Soupfests. On an average Soupfesting days, I make between 3-4 soups. This is great and an effective time-saving technique because at the end of the day, I package everything up and I have soups for the week!! Whao! Happy Souping. On rainy and cold days like today, nothing beats a nice hot cup of soup. 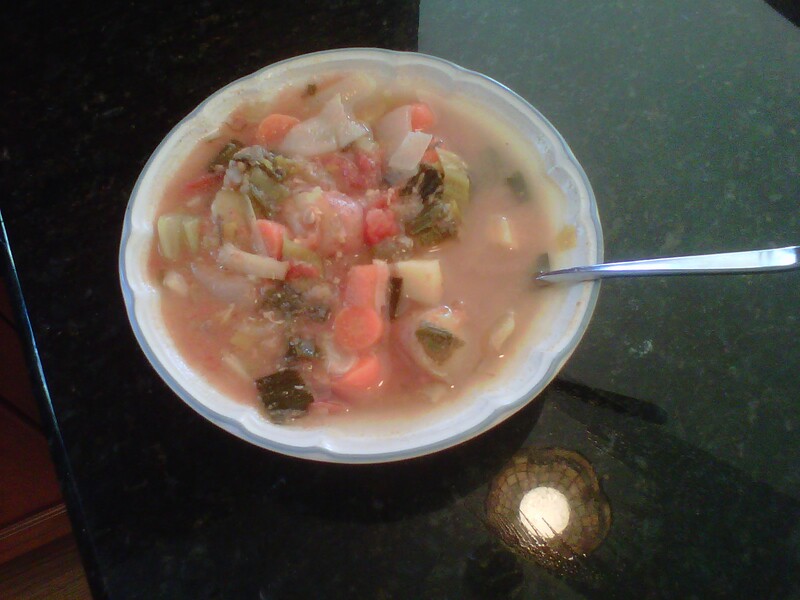 Today’s soup was inspired through 100 Best Fresh Soups by Love Food. It was given to me by a good canine friend Lance for Christmas. Boy, does this dog know how to shop for me ;p.
The ingredients and instructions are very simple and this soup is both healthy and hearty. The undertones of both the sweet potato and squash give the soup a hint of sweetness. However, take it from me, the girl who always chooses savory over sweet, it isn’t over the top. Another bonus is that I recently read the something in a sweet potato actually kills unwanted growths in your body by strangling their blood supply. Yet another bonus for this soup! 3 3/4 cups of chicken broth (You can also sub veggie stock instead). Preheat oven to 375 degrees. Cut your veggies lengthwise and place cut-side down into a roasting pan. Add your garlic cloves. Roast for about 40 minutes until tender and brown. Cool your veggies and scoop insides from your squash and sweet potato into a large pot. Add all of your other veggies and remember to remove your garlic peels before they enter the pot! Add your chicken broth cover and simmer for 30 minutes. Put the soup contents into a food processor and blend. Return your mixture back to the pot and stir in the cream. Simmer for an additional 5-10 minutes or until you can’t withstand tasting anymore! Garnish and enjoy! Soup, Soup E. Doup, Soup E. Doup E. Doup E.
Before I answer, you need to go to a place that you haven’t been in quite a while. Set your clocks back to 1994, what were you doing? If you were like me, you were probably had pimples, looked even more awkward than you were, and served a side of attitude to your parents. You spent your Friday nights going to teen night dances, where all the girls would be dancing on the gym floor and the guys would be running outside in the playground. You would be at the mercy of your parents as they were the only set of wheels you had. Fast forward back to 2010 when my souping craze started….the first song that popped into my head as I chopped up the ingredients was Shoop. However, like most songs, I reworked the lyrics to fit my current activity. All the sudden, I just couldn’t get, “Hey yeah, I want to Soup, Baby. Soup Soup E. Doup, Soup E. Doup E. Doup E. Doup, Soup E. Doup…” out of my head. It has since then become my soup anthem. Although I don’t always blurt out this song prior to souping (as my husband would probably kill me), it always runs through my head. And the souping adventure begins…. Posted on January 16, 2012 January 21, 2012 Leave a comment on Soup, Soup E. Doup, Soup E. Doup E. Doup E.